Who doesn’t love hearing happy adoption stories? Our day got a lot brighter when we received an email with this lovely letter: “Hi, my name is Luanne and this is Jocie. Jocie came to live with me on October 9, 2011. I had just recently moved into my apartment in Seminole, FL, making sure that I moved someplace that was pet friendly as I knew I wanted to find a four legged friend to share my life with. You see, I had been in a really bad relationship for many years, staying longer than I should have but stayed because of my two dogs that we had together. I tried to take them when I left but that was not fair to them as he loved them both very much and they were being taken from their yard and home that they both loved so much. Anyway, had a void in my heart for a while and one day, just decided to look online, just to see what I could come up with. I did an Ask search, looking for pet adoptions in Pinellas County, Florida, and the Adopt-a-Pet.com website popped up. I entered the parameters for the size, gender, breed, age of pet I was looking for and it came back with several dogs in my area that were exactly what I was looking for. One in particular was Jocie. 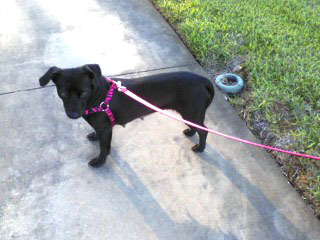 She is a Lab/Dachsund mix, has the best demeanor, estimated around 1 and 1/2, housebroken, and good with kids. I emailed her foster mom, got her background. 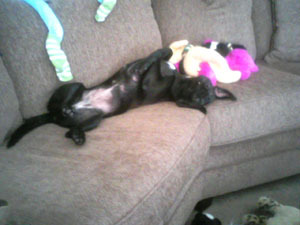 She was rescued from a kill shelter in Virginia by PAWS after being seized from a very neglectful and bad situation. I met Jocie the following Saturday at my local PetSmart, spending 4 hours with her so I could watch her interaction with children especially. I have a 3-year-old Granddaughter and it was extremely important that she would be really good with her. The next day, Barbara, Jocie’s foster mom, came and checked out my house, we did all of the paperwork and I became Jocie’s Mom. It has taken a little while for her to feel completely secure, but that is OK. I have lots of patience because she is worth it. My family just loves her, my Granddaughter especially. She is “home” now and never has to worry about being fed, being warm and most of all being Loved. Adopting my Jocie is one of the best things I have ever done. She makes me very happy. I will take good care of her to make sure she is with me for a very long time. I am very proud to be able to tell people about her and how she came to live with me. Here is another picture so you can see what she looks like. She is short and long, 25 lbs, she looks like a Dachsund and a Lab both. Sounds like a Lab when she barks (which is not often, just during play and fixin’ of supper!! She has the best of both as far as her personality. I give my permission for the use of the pictures and the story… maybe it will inspire someone to get out and rescue one of these beautiful doggies or kitty cat, to make their life complete. Love to all pet lovers! !